I am not talking about tiny, expensive, breakable bottles of essences that will do miraculous things. I have a fairly sensitive nose and how things smell matters to me. There are a lot of less than pleasant smells in the world. Here’s are some mundane things I bring along to make things more comfortable. In the header is a book about photography. Rules at a steep rock with a broken ladder to the top. No one was there to take money or enforce rules. Warthogs are not law abiding citizens. Rule to live by…except I think this sign really meant “keep off the grass”. The real rule to live by. I was just thinking about suitcases, traveling and hauling a smallish but pretty heavy one around. Reminiscing about how I used to pack, which was very light and minimally. How appropriate that today’s (or maybe it is yesterday’s or tomorrow’s depending on your time zone) Daily Post prompt is “suitcase”. I was pretty close to the weight limit on the checked bag and had a full backpack and a tote as well. What happened to me? I used to have one bag, I traveled for three weeks in France using a backpack my sister-in-law called a daypack, we had borrowed it from her because I couldn’t find what I was looking for. Eventually I did, it was a Kelty Moraine, they called it a day-and-a-half pack, I still think it is the best pack ever. I used it for a month long trip to Japan, among others and never felt it was too small, but it wasn’t sufficient for this trip, even though my clothing and toiletries are about the same as ever. Is the change for the better? Yesterday was a travel day and I lugged my luggage. As I was going along, limping because of a blister I pretty much decided that I need to go back to the old ways. To get from the train to the exit from the station you have to go down three sets of stone steps (kalunk, kalunk, kalunk), through a tunnel with a corrugated stone surface (bzzzzzz), then, still corrugated up a ramp (still going bzzzzz). I was really slow. As the exit came into sight my friend, Emily, came running down to hug me (no idea how she got through security) with a beautiful bouquet of flowers, and a cup of cherry tomatoes. I changed my mind and decided that good friends are worth sore feet and achy muscles now and then. The jury is still out on the technology. I am getting ready to take a long trip. So I clicked on some article or the other on Pinterest related to surviving a long flight. One thing led to another and several hours later I emerged awed by how Tricky and clever people can be when it comes to travel strategies. I have taken lots of long flights and have methods for making it more tolerable. Some are things that other people do, some are not, or at least not done by or deemed worth publishing by the various pundits who do those cool infographics. I have, after many long hours perusing when I had better things to do, picked up a couple of new things to try: one is putting small dabs of moisturizer and a bit of beauty balm into an old contact lens container to take on the plane. The other was to take a picture of my travel documents with my smart phone. I won’t be rubbing my hair with a dryer sheet to prevent static-y fly away hair. They are pretty perfumed and really not meant to be rubbed on one’s body. I try to not take up the limited restroom capacity more than necessary. On a trip to Europe one time I had to wait with my legs crossed for the restroom to open up for some time and a teeny-bopper came out having obviously washed her hair! The flights aren’t that long! One can go 24 hours or more between shampoos. Besides, if you look too chipper they won’t think you go with your passport picture! 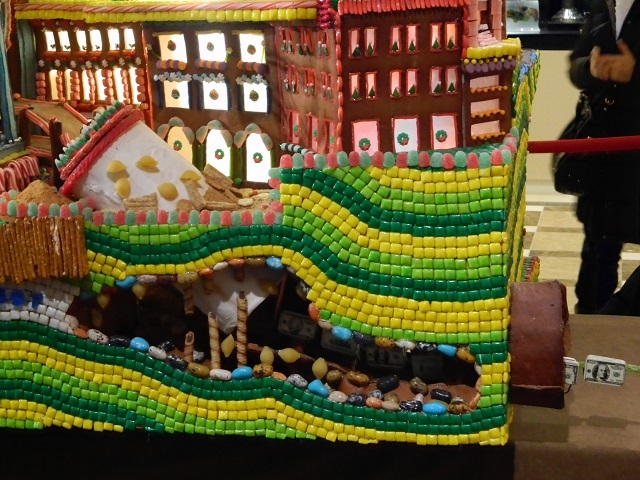 Gingerbread view of Big Bertha-Money going down the drain. After reading the paper this morning I was filled with remorse. 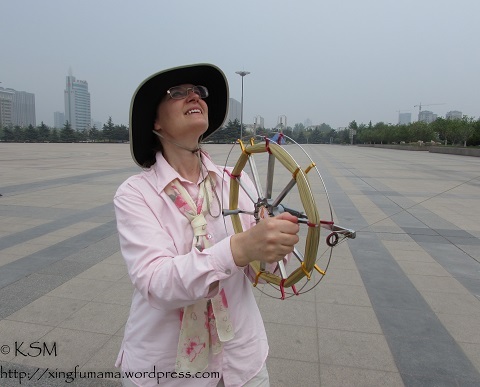 On my last trip to China I called you Big Bertha, after the boring machine (tunnel boring not tedious boring). The paper had an article about Big Bertha. They think it will finally start work again after 2 years of repairs. It was wrong to call you after that machine. You have never stopped working. You have traveled tens of thousands of miles loaded to the max and all your wheels still roll (one does stick a bit and have to be adjusted now and then). In spite of being dragged around and dropped in some fairly dusty and dirty circumstances you look great, a few wet wipes and vacuuming and you look just like you did when you came out of the box back in 2008. To compare you with an expensive machine that traveled only a thousand feet before needing extensive, and expensive, repairs is wrong. Packed and read for second trip to China. Headed out on first trip to China. My excuse is that I like to travel light and you weigh eleven pounds empty. I have never taken a trip with you where you were not pushing up against the airlines’ weight limit of 50 lb. As much as I can lift, and probably more than I should lift, in the awkward ways one lifts suitcases in and out of buses and trains, bending and twisting at funny angles. Christchurch, New Zealand, before the earthquake. Your heavy weight was because you were full of things for people. Books for an elementary school library in rural Kenya, gifts for friends and family. I rarely take you when I travel, only when I have lots to take, yet you have been to New Zealand, Australia, the Netherlands, Kenya (3 times) and China (2 times). You always got where you were going and held up in situations where a lesser, lighter, piece of luggage might have buckled under the load or lost a wheel. Heck, between trips you worked as storage for off season clothing. Now you sit in my son’s room in China, acting as a wardrobe, probably soon to be reloaded for a return trip to the states. Full of souvenirs and gifts for family and friends…and the love they symbolize. But what should I call you now? Bixi at Dai Miao in Tai’an. 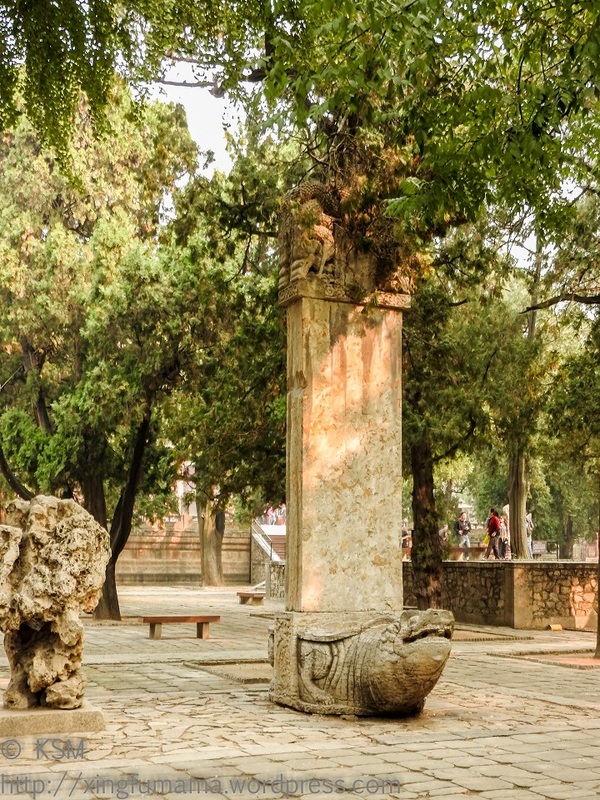 Maybe “bixi” (pronounced “bee shee”, give or take, as the “sh” isn’t quite equal to ours) after the stone tortoises that carry the heavy steles on their backs. The steles commemorate important events. Side note: since the spell checker didn’t like Stele I double checked it and, in addition to being correct, learned that it is the source of the word stellar. I got home yesterday, October 29 at about 8:15 am, Pacific Daylight Time, my day had started in Beijing, China at about 5:15 am (Beijing time). The shuttle to the airport picked me up at about 8:15 a.m. I tend to be where I am pretty completely. But yesterday I got home about the time I left the hotel. Did the day happen? In sci-fi there is a lot of literature about time machines. I say they exist now: airplanes whisk us through the space time continuum. When you are aboard you aren’t really anywhere or anywhen, so in some ways the day didn’t happen. But boy was I tired out by the day that wasn’t! In Chinese “I don’t understand” is “wo bu ming bai” (. It literally means “I not bright white”. Truer words never spoken! Yesterday I arrived at my son’s school gate. The journey to that gate was long, and tiring. 1) I arose in Seattle Tuesday morning at about 6 a.m. (In China it was Tuesday evening at 9 p.m.); I ran errands and shoved even more things into my already bumping up against the weight limit luggage (the bag I checked weighed 49 lb with a limit of 50 lb, the weight limit on my backpack is what I can lift into and overhead bin and I was right up against that limit as well (about 30 lb)). 2) Picked up at 1:30 p.m. And arrived at the airport at 2 p.m. PDT, 4:30 and 5:00 a.m. Wednesday China time. The flight left at 5:00 p.m PDT (8:00 a.m. China time). It arrived at 7:30 p.m. China time (4:30 a.m. PDT). I accrued about an hour of sleep on the flight. 4) Airport hotel shuttle bus was waiting, got checked into a wonderful place, took a hot bath and I was in bed, relaxed and comfortable by 10:30 p.m. China time (7:30 a.m. PDT). But I wasn’t real drowsy I remember seeming 11:30 on my watch. I know I slept some but was awake and not drowsy by 4:30 a.m. Beijing time (1:30 p.m. PDT). I was relaxed and comfortable so let’s give it the whole 5 hours. Quick summary we are at a sleep total of 6 hours and a elapsed time of 28.5 hours. 5) Delicious/leisurely breakfast at 6:30 followed by somewhat less leisurely tooth-brushing, restowing and race to get a shuttle to the airport to get a shuttle to the train station. That went surprisingly well, I got my ticket and got to the boarding location at the same time the bus did. Big Bertha got to ride below but I had the backpack with me and the bus was full, so I had it in my lap. I had to get off the bus last so I had room to put the pack on since I can’t carry that much load unbalanced. 6) Two security checkpoints (lines with x-ray machines for luggage and metal detectors for folks) and two ticket lines later (I waited in the wrong line for a while) and I had a ticket to ride and was ready to heed natures call. About 10:30 a.m. China time (7:30 p.m. PDT). 7) The longest 5 minutes was heeding natures call. All’s well that ends well and the more so when the ending well part was in question: squatty-potty, 30 lb or so backpack…Nothing snapped (like a knee) and I didn’t have to push up from the floor to re-erect myself. So now its about 10:40 a.m. and my train is scheduled to leave at 12:50 p.m.
8) The train was delayed. There was a seriously crowded melee and confusion (mostly mine). But I got to Weifang about 4:40 p.m. Beijing time (1:40 a.m. Seattle time). 9) With backpack on and Big Bertha in tow I got a taxi and handed the driver my carefully printed out address sheet. He let me off across the street from the school. Elapsed time is 41.5 hours, accrued sleep time 6 hours. I did study Chinese for about six weeks before this trip, but when the guard said something, I came out with “wo ming bai”, when I clearly didn’t ming bai (and I probably didn’t look real ming eyed and bushy tailed either!). I quickly corrected myself (I doubt he believed that I had understood), he called someone who spoke English (she also worked with James and knew I was coming so explanations weren’t all that important)…All’s well that ends well.